No. 9, Jalan Kempas Utama 3/4, Taman Kempas Utama, 81200 Johor Bahru, Johor Malaysia. 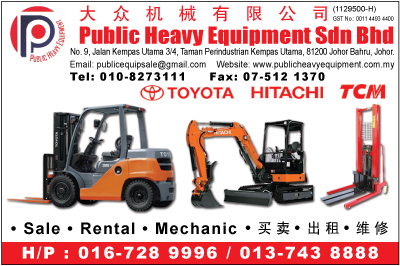 PUBLIC HEAVY EQUIPMENT SDN BHD was established in johor Malaysia , specializing in sales, rental ,repair all kind of japan used and recondition heavy equipment such as : toyota forklifts, excavators, shovel loaders and many other type of used construction machinery . We are the pioneers in this heavy equipment Industry for over 10 years of experience. our sales representative and skilled man power will always providing professional consultation against our products and services.Yours enquiries are mostly welcome and we hope to serve you better. public heavy thank all the customers for their support.